Ever since I was a toddler I've celebrated Xmas. Not being a Christian, I couldn't have cared less about the "Christ" business. But the whole holiday thing? Just my cup of tea! And "X" plays an important part in that. X is the symbol for the unknown and the mysterious. It's the unpredictable and the novel in our lives. It's what makes the world so much more interesting, that element that transcends the known. But what makes it especially great is that it's about the answerable. Implicit in X's invocation is that there is an answer that will be revealed. Xmas morning was all about X. You never knew what was wrapped in those seductive boxes under the tree—but you knew you'd be finding out. Art's like that. You capture that photo in your camera and you can't really know what you've got until you develop the film or pull the image up on the computer. Anticipating and imagining how wonderful it's going to be is a big part of what's so much fun about art—you know you'll get there, but you don't really know where you'll wind up. That's the miraculous power of X.
X makes physics work. It would be just as hard to have modern physics without X as modern math without zero. X is a source of wonderment. So's physics. Take a jaunt with me; this'll be about you...eventually. We live in a universe governed by gravitational force, the strong force, and the electroweak (EW) force. Forces are the noodges of creation. They make things happen. No forces, and it'd just be an undifferentiated, amorphous sea of indifferent quarks waiting for the end of time. Terrible fodder for photographs. Not to mention no way to make them! Forces are strange beasts. They're not just noodges, they're particles as well. You can talk about a gravitational field or graviton particles and you're talking about the same thing (here there be devilish details). That'll matter to us, but gravity itself doesn't matter much for photographers, 'cept as it holds our tripods in place. The EW force is odd even for a force. It has dual identities. One is the weak force, an atomic-scale force that controls the decay of certain subatomic particles. You may think it 's irrelevant to photographers, and you'd be wrong. A charge has an electric field. It's what does the pushing and pulling (that field's "really"—for a loose use of the word "real"—a cloud of charged particles popping in and out of existence in the vacuum). A jiggling charge creates something else, called a magnetic field. A magnetic field, in turn, moves charges and so can change an electric field. It's the yin to electric's yang. Miraculously, a blessed cycle arises. An oscillating electric field creates an oscillating magnetic field. In turn, an oscillating magnetic field creates an oscillating electric field. Each bootstraps the other, and those interlinked fields go racing off at the speed of light. Photons, my boy, the future's in photons! These are the particles of the EM force. Photons carry energy. Charged particles that generate them send some of their energy elsewhere. Charged particles that absorb them acquire that energy. Most of the energy that moves through space travels via the EM force, packaged up in handy, bite-sized photons created by jiggling charges. What makes charges jiggle? Mostly, it's heat. And where does most heat come from? Surprise—it's the weak force, the other facet of EW. The weak force lets neutrons convert into electrons and protons and vice-versa. That's of more than passing interest, because without those conversions, hydrogen fusion doesn't work. And the sun goes out. All the suns go out. There are still photons about, but they're a much scarcer resource. It'd be really hard to make photographs from the thin EM soup that would be left. Heck, it'd be really hard to make photographers (maybe life, but not as we know it, Jim). We'd not be having this conversation were it not for the electroweak force's dual identity, and the peculiar yin-yang nature of electricity and magnetism. Our art is predicated on some obscure and unlikely physics. Ain't that a wonder?! There's something to celebrate. So, enjoy your solstice and have a happy holiday for whatever that means for you. And remember—everyone gets to find happiness their own way. "X" is the first letter in the Greek word for Christ. "X" is an abbreviation that has been in use for over 1000 years. "X-mas" is not as secular as most people think. Uh, and a Merry Christmas to you too. I think. Sorry If this disappoints you, but the early Christians used the letter X as a symbol of Christ. Especially when it was a death sentence to mention his name. X fits everyone. It's inclusive! Even if some people take Xmas as an insult. Christmas was not a secular holiday (variants of Sun worship, not Christianity though). But any holiday takes on the values given to it by its celebrants. You're Christian, and Christmas is a Christian holiday. You're some form of Pagan, and it's marking the rebirth of the Sun. You're atheist, and it has no religious meaning, but a feast with your family and friends to dispel the midwinter gloom. And if you're Japanese, it's the time to buy a lot of stuff in preparation of the New Year, and have a romantic dinner and make out with your girl/boyfriend. Yep, the commerce is the most important part here as well. And it's not a family holiday, but celebrated largely as a singles' evening, with "Christmas Dinner" at a romantic restaurant. Any holiday is no less than what you want to make of it. And no matter how you celebrate it, have a good Christmas everyone! The shortest day of the year makes a lot of sense for a celebration. Days start to become longer from now on, a new cycle starts, the sunny 16 rule will be good for another year after all. Obviously, most cultures will base their celebrations around this time. Me, I consider the name "Christmas" as related to Christianity as the name "Thursday" is related to Thor. So even though I'm far from being a Christian, I have no problem saying merry Christmas to people. So, merry Christmas, or Xmas, or Sol Invictus everybody! Hey, Juan Buhler. This is a note to say that I enjoyed looking at your work. You seem to be an invisible man, only the dogs can see you..your humans don't seem to be able to do that. Lots of great images there. The universe is a very beautiful machine. If its basic properties were only slightly different, we wouldn't be here to appreciate it. Of course, that doesn't prove that the universe was "designed", but its an interesting puzzle. 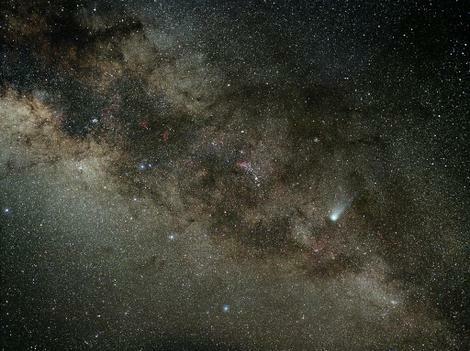 That looks like Halley's Comet crossing the Milky Way. You would understand the new Electro Magnetic Vehicle designed by ISITEL. For years I've wanted to produce a bumper sticker with the message, "Let's Put The X Back In Christmas." Heh heh! Thanks for the holiday chuckle. First big reason ISITEL is a fraud. It won't run on solar power (well, not any that YOU collect). Insolation at earth's surface is 1 KW per square meter, max. That's 1.3 HP/square meter. Best you'll do off of solar cells is 20% conversion efficiency-- one-quarter HP/ sq.meter. That's for the sun directly overhead, clear skies, etc. Real world? A non-tracking collector does well to collect the equivalent of five hours of such sunlight a day, best case. There are maybe 3 square meters of surface available on the car. Do the multiplication and you get a total energy of about 4 HP-hours collected by your solar cells, each day, if you're really lucky. The electric motor in the car is rated for 40 HP peak, 10 HP continuous. 10 HP is not going to give you very good performance (hysterical understatement!) and you'll still run out of juice in 25 minutes. Then there's the maglev part. Conventional maglev won't work on pavement-- it needs a conductor to 'push' against. Diamagnetic levitation will work with nonconductors; you can even levitate small animals like frogs. It's thousands of times more difficult and consumes tons of power. * if the effect really exists! It ain't even proven to be real. Yup, Comet Hally, 1986, photographed from the summit of Haleakala. Camera, Pentax 67. Lens, 105mm f/2.4. Exposure time, 5 minutes, with camera on a telescope mount and a clock drive plus hand controller. Film, Kodacolor 400. Alternate universes are an interesting topic in cosmology. Until recently, all of the alternative possibilities looked very boring (universes that collapse back onto themselves in seconds, universes that rapidly expand into a thin gas, uniform seas of unconnected particles). But several have recently been discovered that do have interesting existences with alternate physics. So, I strongly suspect there are 'billyuns and billyuns' of interesting universes with alternate physics (out of the 10^500 possible ones). This makes the anthropic principle of much less pressing philosophical importance. And, as you note, it has no bearing on the existence of a Creator. Brother Guy spends some good time dissecting that fallacy in GOD'S MECHANICS. God(s) cannot be logically deduced from (nor disproven by) an orderly universe; that's an axiom, not a conclusion. It never ceases to amaze me how far people go to discount Christmas and its Christian origin. But that's OK, we should be tolerant. I bet though that there's no discounting of certain other religions holidays... no that would not be PC. Halley's Comet from the top of Haleakalā ? Now **that** is truly glorious !! My thinking on it is about the same as Juan's. I was raised as a christian, but am certainly not one now. To me it is all about the celebration, and christmas has become kind of a generic word for get-together or celebration. I like it that way, and feel just fine about wishing a merry christmas to anyone, even you heathen! So, merry xmas/christmas/solstice or what have you!!! I wish I could agree with you, but I think Barr is anything but a good read. There are multiple serious flaws in his argument that are so fundamental that it really devolves back to the point I made-- people arguing for or against Creation basing their arguments in Science are not actually building an argument but merely reiterating their thesis. I will not attempt to deconstruct Barr's well-written book in a few paragraphs-- it would do him disservice. I will note that his understanding of the philosophy of statistics and probability is simply wrong (which is partly why his arguments are easily undercut). 1) Every scientific description of 'reality' up to the current one has falsified its predecessor. 2) There is no particular reason to think that we have arrived at the ultimate description, from any strictly physical point of view. 3) So, if you build your faith on its congruence with current science, what happens to that faith when the current science is disproven?! As it very likely will be, if history is any teacher. Logic dictates that either your faith is put at risk or you must construct a new, different argument that connects the new, different science with your old religion. The former is unacceptable; the latter makes all such arguments dubious and assailable. There are myriad historical examples of good science leading to bad theology and bad theology leading to good science. Historical attempts to validate one via the other have always failed. Keppler arrived at his planetary laws of motion because he was a mystic who believed the Sun was actually the physical manifestation of the Godhead. The traditional circular orbits were 'pure' in form, but a heliocentric system with circular orbits requires the sun to also orbit about the center of the universe, like the planets. Why should the site of the Godhead be at anything but the center?! Axiomatically, it must be! Keppler came up with the correct elliptical orbits, because they correctly predicted the motions of the planets AND correctly placed the sun at the center of the known universe, as his faith told him it should be. The result of this reasoning was the fundamental breakthrough into modern astronomy. Keppler's laws and models are extremely useful to this day. Hardly any of us today, though, think God spends much time hanging around in the sun. Should the day come when my faith seems in any way to be derived from the physics I know, I'll consider that a serious crisis of faith. whoa! that was probably the deepest post I've read on here all year. Cheers Ctein. Happy Christmas to you and Mike and other contributors and thanks for the many interesting posts over the last 12 months.